Sake-glazed Black Cod with "Pappa al Pomodoro"
The recent release of the motion picture Julie & Julia has introduced a new wave of gourmet at-home, I-can-take-on-anything chefs. In keeping with this spirit, Im�go's Chef Francesco Apreda is offering the recipe for one of his most popular dishes, Sake-glazed black cod with pappa al pomodoro - a rather simple preparation that it is sure to please the most discerning palate. Any bloggers out there ready for the challenge? Stew one finely-cut leek with some olive oil for a few minutes. Add five medium-sized diced tomatoes as though preparing a simple tomato sauce, and add salt according to taste. Add a handful of finely-chopped basil and a half-loaf of hardened white bread (cut in slices one day before and let dry) and cook for another 20 minutes, or until mixture looks well-blended. Scale and de-bone 2 pounds of black cod, making 6 portions. Meanwhile, prepare a sauce made of 4 tablespoons red miso, 3 tablespoons sugar, 3 tablespoons sake, 2 tablespoons rice-wine vinegar and 2 tablespoons water. Sear the skin side of each cod fillet in a pan with olive oil and salt and then cover with the red miso sauce. Cook on medium heat reducing the sauce completely so that it becomes a dense glaze, at which point the cod will be cooked (about 15 minutes). During the process (and particularly towards the end), continuously glaze the cod fillets with the red miso sauce, using a spoon, coating the fish entirely in the sauce as it cooks. Lay the cod fillets on top of the pappa al pomodoro. With arguably the best panoramic view of the Eternal City, Hotel Hassler Roma's rooftop restaurant Im�go recently underwent a multi-million dollar redesign (the first since the original Rooftop Restaurant opened more than 50 years ago), and was also recently awarded its first Michelin star. Headed by Chef Francesco Apreda, whose international training includes five years both in Japan and London, Im�go's cuisine is an artful combination of traditional Italian ingredients and flavors with creative and innovative preparations. The d�cor follows suit, blending modern and classic styles with pale grays and custom-designed mirror tables that mesh beautifully with traditional touches of white marble flooring and antique-wood inlay. Menus vary according to season, and Chef Apreda's whimsy. Set atop the Spanish Steps and featuring a panoramic view of the entire city, the Hassler Roma has been Rome's five-star lodging of choice for the world's elite for more than a century. Each of the 82 rooms and 13 suites is individually designed and adorned in authentic Italian accents. Highlights include the panoramic rooftop restaurant, Im�go, and the neighboring, Hassler-owned Il Palazzetto, a charming 16-century palazzo that offers a restaurant and wine bar with panoramic terraces, four rooms, and the International Wine Academy of Roma which offers wine-tasting classes with world-renowned sommeliers. For more information on Hotel Hassler Roma, visit: www.hotelhasslerroma.com. Internationally-acclaimed Chef Roy Yamaguchi made a special trip to his Pasadena restaurant for his August 12th culinary event. Titled �Aloha Kitchen Challenge,� the gourmet competition paired three culinary students from the California School of Culinary Arts Pasadena: Stefan Lam, Philip Lee and Ariel Fujita with top chefs Akira Hirose of Maison Akira; Gary Watanabe of Ruth�s Chris Steakhouse Pasadena; Daniel Rossi, of CSCA; and Chris George of Roy�s to win a prestigious internship with a Roy�s chef. Judges for the challenge included personalities, such as Oz Scott, TV and movie director; Janet Varnay, host of TBS� �Dinner and A Movie�; John Ratzenberger, of Cheers fame, Sarah Haufrect, managing editor for Pasadena Magazine; and Nigel Clark, vice president of international marketing for Sony Pictures. The partnering chef teams were asked to create an exceptional dish in the spirit of Roy�s signature Hawaiian Fusion� Cuisine. Guests enjoyed the one-of-a-kind dining experience and indulged in the five-course dinner� which included a course created by Chef Roy and Roy�s Pasadena�s Chef Partner Chris George, and one dish from each competing team. Judges rated each team�s creation on taste, presentation, and individuality, and awarded Ariel Fujita the top prize. Her Asian Flank Steak won rave reviews from over 200 guests ad judges alike. Bianca's Gourmet offers Caponata, Pesto Piccante or Orange-Apple Cranberry Chutney. These delicious spreads can be added to any pasta or vegetable, or poured over grilled salmon, chicken breasts or lamb for a quick and tasty meal. Jeff's Original Chili Butter is smooth, sassy and delightful over pasta, veggies, chicken or steak for a quick and flavorful meal. Granola Girl's Cranberry Almond or Maple Pecan granola mixes make sweet snacks and are the perfect addition to yogurt for a healthy breakfast. 1. Preheat oven to 300 F. and prepare an ice bath. 2. Trim 1 inch off the asparagus stems. In a medium saucepan, bring water to boil, add asparagus, remove after 1 minute and put into ice bath. 3. In a saut� pan, add olive oil and butter, melt. Add onion and saut� until translucent. Add asparagus, cream, salt and pepper; let simmer approximately 10 minutes. NOTE: If mixture is still bubbling, cool slightly before putting in food processor. 4. In a food processor, add asparagus mixture, process until smooth. 5. 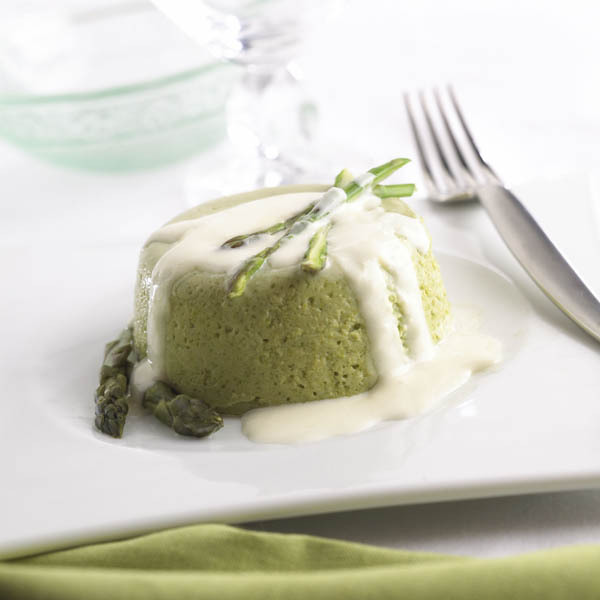 Stir asparagus-cream mixture into beaten eggs. Add grated GranQueso, and beat with whisk until ingredients are combined well. 7. Add asparagus mixture and place in bain-marie. Cover ramekins with a sheet of parchment paper. 8. Bake in preheated oven approximately 30 minutes or until mixture is set. Remove from oven and keep warm until service. 1. In medium saucepan, add first 4 ingredients. Bring to boil; remove from heat. 2. Add the shredded Fontiago, stir just to blend, and let sit for 5 minutes. 3. In food processor or blender, add the cheese mixture and process until smooth. Keep warm. 1. Place baked, warm flans on serving plates. 2. Dividing Fonduta evenly among plates, pour the warm Fonduta over each flan. 3. Drizzle each flan lightly with truffle-infused olive oil. Top with sprinkling of saut�ed mushrooms. FORK & FORAGE: Bursting at its agricultural seams, Monterey County celebrates its culinary roots with a wealth of regional finds. Ideal for the foodie on a taste trek or traveling oenophile seeking the next new vintage, this county boasts a sinful round-up of local calamari, red abalone, artichokes, sardines every-which-way, stellar Salinas greens and a cornucopia of events. ). FORK IN HAND, FOODIES CAN DIVE INTO the Big Sur Food and Wine Festival (11/5-8), Cal Stamenov�s 13th Annual Truffle Dinner at Bernardus Lodge (11/11) or the 13th Annual Great Wine Escape Weekend (11/13-15). Top Picks: Cooking for Solutions, sustainable seafood conference (May/2010), Pebble Beach Food & Wine (April/2010). Roth K�se USA cheeses captured five awards at the 2009 American Cheese Society Competition in Austin, Texas, including three blue ribbons for Valfino, St. Otho, and GranQueso. This year�s competition drew a record-breaking 1,327 entries from 197 companies in 32 U.S. states, as well as Canada and Mexico. Valfino, a velvety semi-soft cheese with a dynamic flavor profile rich in beefiness, earthiness and a hint of spice and fruit, took top honors in the competitive American Originals (Cow�s Milk) category. St. Otho, a low fat washed rind cheese handmade in small batches, earned first place in the Low Fat/Low Salt Cheeses category. Rounding out the triple blue ribbon play was GranQueso, which has won top honors in the Hispanic and Portuguese Style Cheese category for the sixth year in a row. Shelf cured for at least six months, GranQueso is similar to a Spanish Manchego, yet crafted with cow�s milk, creating a distinctive bite and lingering sweet finish. Roth K�se USA also captured a second place ribbon for Petite Swiss in the American Made/International Style Category and third place in the Flavored Cheeses category for Peppadew� Havarti. �It truly takes a team effort to craft award-winning cheeses, and these repeated awards underscore our team�s continuing commitment to cheesemaking excellence,� said Fermo Jaeckle, Chief Executive Officer. For more information on Roth K�se cheeses, contact: Kirsten Jaeckle, Director of Marketing, phone 608.845.5796 ext. 5, or visit www.rothkase.com.